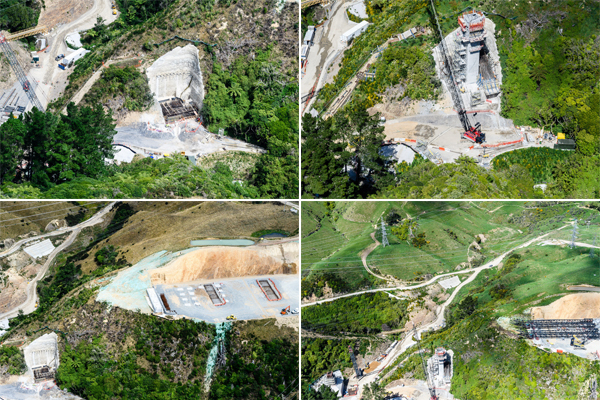 2018 has been a big year for the Transmission Gully Project with works progressing rapidly. As much of the project work has gone on behind hills and out of the public eye, this newsletter will showcase a few before and after images so you can see how the project has moved forward. Many people are involved in the delivery of this nationally significant project – and we’re proud to employ some of the most skilled people from around the world for this work. Last month the project clocked over five million work-hours to date – a huge number that will continue to grow as we get closer to the finish line! From all the team involved in the Transmission Gully Project we’d like to thank you for your patience and support for our work and we wish you and your loved ones a safe yet fun Christmas and New Year. See you in 2019! Northbound view of the new piece of local road that will be opened in December. 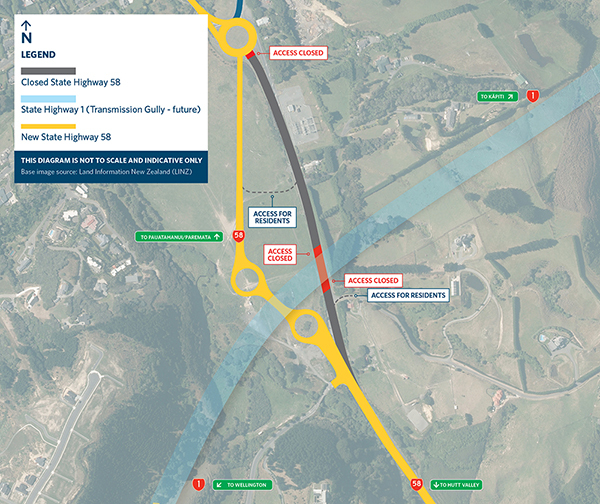 The 27km long Transmission Gully motorway project has reached a significant milestone with the first stretch of final road surfacing work just north of Paekākāriki. Aerial view above Mackays Crossing looking across State Highway 1 along the transmission Gully route. With summer well and truly here the summer works programme is now underway. The next few months will see significant progress across the project’s structures with many nearing completion in the final summer of bulk earthworks. Engineers look on as demolition experts dismantle the old bridge. Sometimes a picture is worth a thousand words. Below are snapshots of before and after aerial images showing some of the fantastic progress that has been made this year. 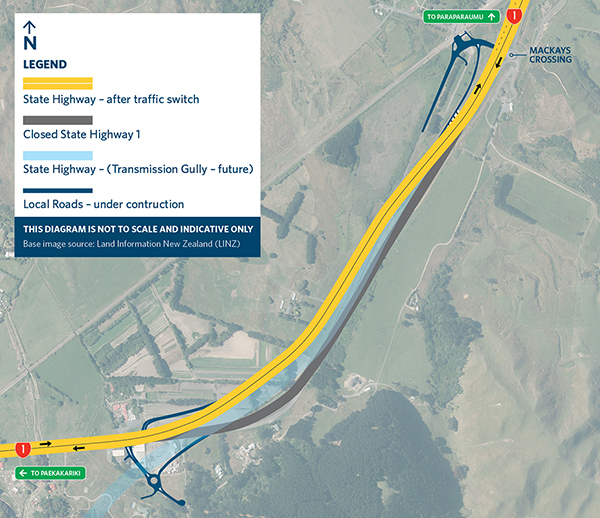 On Friday 14 December we will be switching State Highway 1 over to an interim layout, using part of a new stretch of road that we are building between Paekākāriki and Mackays Crossing. This will eventually be a local road that will run alongside the new motorway to provide a second route to and from Paekākāriki and the Centennial Highway. There will be a lot of work in early 2019 at the Bradey Road intersection while we work to switch State Highway 58 over to its new final alignment. Women In Construction 2018 Award recipients from left to right: Papua Taumate, Gabby Bush and Jemma Dutton. With a project the size of Transmission Gully Motorway, having a great team is vital to the success of the construction. Ensuring the employment of the best people for the job has been a key factor for the TG project team. The community team attended the Pauatahanui School's annual Lamb and Calf Day. Transmission Gully touches many communities along its route and we try to get involved where we can, particularly with schools. Pauatahanui School is right at the heart of our project and over the last few years we have been able to support the school in a number of ways. Seven Sharp's Arrun Soma takes a sneak peak at Transmission Gully. On Monday 10 December, a short three minute story on Transmission Gully aired on Seven Sharp. Take a look at the coverage including some exclusive behind-the-scenes footage. Transmission Gully visitor centre in Civic Square. Have you stopped in at the Transmission Gully Project mobile visitor centre currently located at Civic Square yet? If not, you’d better be quick, as the mobile visitor centre will be picked up at the end of the month and transported to Battle Hill Farm Forest Park.